It was a great week of skiing with fabulous weather and lots of laughs. Photos are on the website. Have a good weekend! On the M25 – All passports will be found in the children’s hand luggage in a zipped up compartment wherever possible! We are not used to this rain having enjoyed brilliant sunshine every day bar one! Franz signing off for 2016. Now taking booking for Easter 2017! Ps – X-rays also in hand luggage where appropriate! Franz over and out! All aboard the coach in Dover waiting to depart. It is 0830 English time so we will be back at school around 1000. Children all had breakfast on the ferry and the perished the shop trying hard to spend every last penny! Franz’ plea “Don’t buy rubbish” clearly falling on deaf ears! Children now eating the sweets they bought on the boat so they will be nicely hyper by the time we hand then back. EHIC cards will still be in their ski jackets. Nurse Jones is returning any leftover medication to hand luggage. Mr A is returning any leftover pocket money and I shall hand back passports when we get closer to school. See you all around 10.00am. Don’t forget that the clocks have gone forward otherwise you will have a long wait – BUT please don’t be late. 10.00am – see you soon! We have gone through the Mont Blanc tunnel and are now making our way through France towards Paris! Toilet stop soon, then all games away so we can try to sleep! Shouldn’t be too difficult as all aboard are shattered! On the coach now! All (some) showered after skiing and changed into going home clothes! We sad goodbye to OG and AN who are staying in Chamonix with their parents. Supper was pasta followed by burger and chips. Coach all loaded and eventually we departed. Minions movie keeping the restless masses quiet. Only 12 hours to Callais! Franz has stopped skiing! He spent the morning with LC trying to find the beginners group to return JM’s helmet but could not find then on the beginner slopes! We forgot that they are no longer beginners and were confidently skiing down reds! It is very busy with queues at very lift so have returned to the Yeti to lunch and check up on those tanning! Would you believe it! JM left his helmet in the gondola- the only time this week it has happened! The option is to wait 30 minutes for the gondola to do a complete circuit with the rest of the group also waiting; or Franz lending him his helmet, spare gloves and spare goggles! Met up with the Griffin’s and Nabar’s who have come across from Chamonix and will take Orianne and Antony back with them for another weeks skiing! Children all packed before breakfast. Rooms checked and luggage all moved into corridor so the hotel can get rooms ready for the next group that arrive tomorrow morning. Year 3 & 4 boys much better than the girls! Year 5 & 6 boys also better than the girls. Year 7 & 8 girls beat the boys! I just hope that everything is packed in the right bags! Last breakfast! Last Miss Jones’ hair salon! A big thank you to the hotel owners who serve us breakfast! Sam R presented them with a box of chocolates to say thank you! On the coach to the slopes now – watching the end of “home alone”. Miss Martin and Mr Mcguigan departing for the station to get the train to Milan and then off to Venice and Rome. Blue sky has returned for our last day on the slopes! Ski presentation completed. All children received certificates (which I have collected for safe keeping) and badges (which they have kept). I discovered tonight that EW skied on day 1 with her boots on the wrong feet and AB is the best jumper in his group, but the worst lander of jumps! All the instructors were impressed with the persistence and determination of Copthorne children which pleases the Headmaster as these qualities are vital for future success in life! Children all in bed dreaming of parallel turns; moguls; powder; steep blacks; off piste; 180’s and 360’s! Franz in bed having nightmares about the 14 hour trip home tomorrow night! OF tucking into his second bowl of pasta – he obviously skied hard today! Franz is very impressed with the beginners group who have made brilliant progress! Sadly for Mr A the steak knives were actually pizza knives! Impromptu art lesson going on as Mrs B holding a design your napkin competition using the free Interski pens! Non pizza eaters having pasta. Chips just keep coming! This is the quietest the children have been at supper all week, and their are no other guests dining in the restaurant! No sign of the romantic couple from last night. I saw VS smile today and MJ smiling as she had another day without a visit to the medi centre! Back at the hotel and staff are impressed with the children’s packing. Whether they have packed the right stuff in the right bag remains to be seen! Mr A excited as our table is laid with steak knives! Chris our ski rep is distributing some Interski freebees – pen, pencil and bracelet much to the children’s excitement! They are easily pleased! On the coach back to the hotel, still watching “Home Alone 3”. SR in absolute stitches and really LOL! In the hotel to shower and start packing. Ski presentation this evening after supper when all our little skiers receive certificates and badges! No topping up tans for MJ and EWo today! They sat outside people watching until it started snowing and then adjourned inside! EWo now world champion on “pipelines” game on her iPad. Short lunch break before mad Head of Science dragged us off for more skiing. Mad Madam Mimm (LC) decided to attempt the wall in zero visibility. Franz had far more sense and latched on to the beginners group who are all now skiing parallel- they have made brilliant progress! Advanced and intermediate groups are playing in the ski park. No one except mad scientist venturing up to the top, she survived! Lunchtime – Cloud/mist now winning 3 – 0 as sun has now disappeared! Busy day on the slopes and Franz has to queue at the lifts. Children instructed to queue like an Italian with sharp elbows out to stop the queue jumpers! Not used to queueing- perhaps we have been spoilt for the last 15 years! JJ skied with the intermediate plus group learning to do 180’s and ski backwards! NJ best at racing turns, PK best at 180’s and landing them. EM best at falling over! Just gone through the boot room to put on boots and collect skis and poles. Assemble outside for a headcount and final check. Missing AN – who had gone back inside to find his gloves that I can see on the wall outside next to his skis! Off we go … JCL why are you coming back … “To fetch my gloves that I left in the boot room!” All good to go now! Sun is winning 1-0 at the moment! Read the blog last night on the website! CK making sense of Franz’s one finger texting. One clarification however – FT is the champion arm wrestler having beaten all the year 8 boys. Sun is fighting with the morning mist – not sure who is going to win! All pre-departure checks complete. The little skiers are well used to the routine now and can assemble on time, with helmets, gloves, goggles, sun cream, pocket money, lunch voucher, lift pass, medi card and EHIC card! How on earth the same children cannot get to a lesson with a pencil case, on time back at school, I just don’t know! Year 6 girls drumming “the cup song” everywhere! Not at the table please girls! Can you do it softly please girls! JC/AG/OG/KM/ASR that’s enough – Franz has a headache! Children watching “Home Alone 3” on the way to the slopes! Another day on the slopes with 41 super skiers and 1 armless but well tanned child – what else could we be doing on our thoroughly well earned holiday! Happy Easter! Shock, horror – no blue sky to greet us this morning! Misty cloud – it could be snowing up top! An extra layer and a goggles day today! LJ hair salon in action, LC providing an alternative but vastly inferior (her words) option! All fed and watered. I hope the stories being texted by the Year 8 children on their own phones match Franz’s official version of events! All the children dismissed to get into the shower and pj’s. Noise level dramatically reduced! Romantic couple back on track- wedding bells perhaps on the cards! Queue at the door of people wanting to dine at the hotel! Perhaps we have celebrity status and locals just want to be seen in the same restaurant as us! Fame at last!! Guess what we are having for desert? Ice cream!! No joined up thinking today!! Joined up turns from the beginners, but no joined up thinking with the hotel. Children tucking into their third ice cream of the evening – brain freeze all round!!! Young romantic couple look very bemused! Some very tired looking children; tired maybe but noisy definitely. Must be all that sugar from the ice cream. I feel sorry for the two other families who chose tonight to dine out at the hotel Bellevue! Correction, three families! Another young couple just arrived for a romantic meal – no chance to whisper sweet nothings in each other’s ears, they will need to shout at each other just to be heard! Memorable day on the slopes as NO VISITS TO THE MEDI CENTRE. MJ has a very tanned face as her day was not broken up by a visit to Dr Doolittle and nurse Gladys Emmanuel!! FT is the champion wrestler! Year 6 girls are all doing well! Just returned from our visit to the ice cream parlour. Walking through Aosta with 42 children is traumatic but they were very good at walking in pairs in a long chain. Real Italian ice cream is lovely! Some went back for seconds. Back at the hotel now ready for supper. Showers and room inspection to come afterwards. Pasta carbonara for starters. Meat and potatoes to follow. Lunchtime at the Yeti! Franz checking up on EWo, MJ and LJ’s suntans – coming along nicely! Just seen the helicopter take off but thankfully no telephone call! Fortune is smiling on us! RP’s missing helmet and goggles have been found in the boot room (probably where he left them)! JM’s missing glove has also been found! On the gondola with him now – he is linking turns and has been on the red runs. Learning to use poles today! (FT has been learning to lose poles!) NKJ’s highlight of the trip so far was her face plant with the rest of the Year 8 girls watching and cheering from the chairlift above! TW’s highlight so far is eating pasta for lunch at the Yeti bar! Another feast for breakfast. Another beautiful day. RP’s helmet is still missing – a bit like his front tooth that is also missing! WC is fine and raring to ski! Children getting used to the routine … Helmets, gloves, goggles, sun cream, ski socks (yes AB go back and get some! ), pocket money, lunch voucher, lift pass, medi card, EHIC card, ….. Ready to go …. Room inspection tonight! Children now desperately tidying ready for the Gap Students to come round and check for:- tidy clothes, tooth brushes wet, toothpaste used, shower gel used, towels wet, ski clothes ready for tomorrow, all old sandwiches, fresh produce from food hampers on the journey out has been thrown away etc. the occasional bribe for the judges has been known to add some points! The hotel have just produced a fantastic birthday cake for CF complete with sparklers! Another rendition of Happy Birthday before cake is cut into lots of pieces! I feel sorry for those with a nut allergy – they got a banana! Afternoon sking – Franz followed the creative Art teacher for the first part of the afternoon. We saw the advanced group again doing jumps. Miss J Jones went airborne on her snowboard! Mrs Jones off for her third visit to the medi centre as WC had hurt his ankle. MJ on first name terms with the staff – another x-ray, only bruised, another 50 euros! WC now merrily tubing with everyone else as is NJ and VS who also bailed out of lessons early to give some moral support to the well tanned EWo! ZR went down the black run face first and lived to tell the tale! The beginners are now off the baby slopes and taking the chair up the mountain. They are all linking turns together very well! FT will be an advanced skier by the end of the week! Sadly, Franz and Mrs C failed miserably to charge up the camera batteries so photos of tubing will be few and far between! We are only human after all!!! All groups successfully rendezvoused with their instructors and off they went, MJ and EWo adopting the sunbathing position in the Yeti bar with EWo also colouring! Too late for an Art Scholarship now! Franz and LC decided to traverse the resort – bumped into the advanced group ( not literally) who were sking very fast and seeking out every bump and jump possible! Franz just watched from a distance! Non stop descent from top to bottom gave Franz a severe case of thigh burn trying to keep up with our mad scientist! Hot Chocolate in the Yeti bar is so thick you can stand a spoon up in it – delicious! EWo now on the iPad, MJ and LJ tanning! Miss J Jones (unknown to many children) is taking photos on the beginners who are clearly not beginners any more – some are actually remaining on 2 feet most of the way down the baby slopes! I think it is time for lunch – somehow Franz missed out on his second breakfast! Advanced group now arrived at the Yeti bar for lunch! As All helmets checked on the coach but by the time we got out of the boot room RP’s had vanished – goggles also attached to disappearing helmet. Thorough search of coach & boot room revealed nothing. Spare helmet and goggles produced by Chris our brilliant Inters rep – so all happy! On the gondola now with LP, BMc, Mrs C and a random snowboarder who jumped in at the last second! Mist has now cleared – another beautiful sunny day in the mountains! Franz, over and out for now! All pre-departure checks completed. Ski socks now added to the list of checks! All aboard the skylark!! Early morning mist yet to clear so mountains are currently invisible but the sun will burn it off soon. Birthday boy was sporting a very fetching moustache that he miraculously grew overnight! Happy birthday CF!! Lots of excitement opening his presents. Thank you Mr & Mrs F for the noisy and repetitive bop it game – very thoughtful of you!! Miss J’s hair salon open for business as usual – only 12 plaits/pony tails/bunches this morning! One or two tired looking children! Copthorne choir about to sing Happy Birthday, music scholars NJ and NJ to sing the descant! Apologies to any parents who phoned the hotel tonight! When we go out for pizzas it is usually because the hotel chef has the night off! Apologies too for the lack of photos, but the hotel wifi is very patchy and emailing photos is proving difficult! The owners of the pizza restaurant brought out their home made chilli paste! MA and LC were well up to the challenge, but the softy Australian HM nearly choked! Everyone smelling clean and fresh and glowing! Back on the coach and on the way to Aosta and pizza – “I don’t like pizza”. OK you can have pasta instead! Reminder about table manners – I wonder if it will make a difference! I feel sorry for the other diners who have booked a romantic meal for two, only to discover 42 hungry English children invading their restaurant! The drivers have stocked up with water so our hot skiers can all have a drink when they get to the coach (a good idea Franz!). On the way back to the hotel to shower and change before we depart into Aosta for pizza. Going down in the gondola with AB, OC. ALA, LR. All have exciting tales. LR has been down a black run! AB has done a face plant – may have it captured on his go pro camera. ALA belly flopped on the jumps, OC crashed into a wall! All still laughing!! Franz now stopped for the day – creaky knee even more creaky trying to keep up with mad Head of Science! EWo and MJ spent the afternoon topping up tans and colouring! NJ joined them mid afternoon complaining of tired knees – must be something in the surname! Heard on the grapevine that CR bent his pole in half but as yet this is rumour not fact. CF allegedly is giving everyone in his group an early birthday present by skiing into them! Two year 5 boys overslept and nearly missed breakfast … They obviously skied hard yesterday. LR missing glove was on the coach where he left it! Sun cream check! Helmets check! Gloves check – VS wooly mits from yesterday have been replaced with proper ski gloves from Franz’s spares bag! Lunch vouchers check! Pocket money check! Lift pass check! Headcount 42 check! All aboard and off we go! Just put the Year 3 & 4 boys to bed. All very happy. WC tuned in to his “sleep music”. CF has only two more sleeps until his birthday, SR confessed he took his toothpaste up the mountain because he thought it was sun cream! LOL! Thankfully he realised before he has applied it, and one of his friends lent him some! I think that is a first in over 30 trips! Ha ha ha, I did chuckle. A very exciting evening of bowling. One of the drivers clearly had a misspent youth and won convincingly! MJ increased her lead over CJ with a 126 to 124 point victory (I am not really bitter!). ZR/TW were the best child bowlers with 122. RP next with 119, AB 108 and LM with 106. Sitting in front of LG. I thought she was a very quiet girl. OMG can she talk! Now that parents have been informed, I can declare that Mrs J had her first visit to the medi-centre earlier this afternoon. AS-R x-rayed and all well. Medical staff are always hyper cautious and x-ray everything. She bumped her knee but will be good to ski tomorrow. Franz’s aged knees are creaking loudly! On the way to bowling now! Teams already picked at random! CJ out for revenge as MJ’s team has won for the last few years. She is so competitive – it is easier to let her win! Supper time – or feeding time at the zoo! Pasta for starters. The hotel has cooked gluten free pasta for some, vegitarian sauce for some, then one boy declared he has given up meat for lent so they have produced another vegitarian meal! Chicken and chips, to follow, with some chips cooked in separate oil to guarantee no nuts. Fabulous! Note to self- must try to improve children’s table manners. DP trying to cut his chicken with blunt side of his knife; children reaching over to grab the ketchup/mayo! Bananas for desert and most of the little monkeys tried one! Staff group have all returned to the bottom to wait for the children to return after a perfect day of skiing. Lots of happy children with tales of snowy exploits! On the way back to the hotel now for a quick shower then supper then bowling! Oh happy days!! Everyone have their own skis? – check. Whose got JCL’s skis – not JCL but EM. All sorted now! Whose helmet is this? Put it on your head! There is a pair of gloves on the floor – it is like herding cats – Young kittens !!! All into ski groups – no FT you are not an advanced skier yet but you could be by the end of the week! Inhalers – check! epipens – check! Off you go – have fun! Staff head for the lifts. Glorious feeling – skiing on perfect snow in beautiful blue skies! Children all slept well and woke up to brilliant sunshine and blue skies. Breakfast was a feast of cereals, bread rolls, jam, cheese, cold meats, croissants, water, juice, hot chocolate etc. Supper was soup (with bread to dip) followed by pork and carrots and ice cream meringue! Our Ski Rep is called Chris and he explained the week to all the children, some of whom were listening, others were almost asleep. Early bed for all tonight before breakfast and our first look at the snow! Sweet dreams! All children had pasta for lunch and rooms were then sorted. Most children have showered, some were rejected for putting the same clothes back on! Miss Jones now plaitting long hair and Mr A is organising the bank! The School ski party has arrived safely at the hotel in Pila. Picked up Orianne safely. En-route to the tunnel. The Minions movie is fun! Children still eating – sweets mostly! Two coffees later and I feel human again! Everybody fed, watered and now wide awake! Back on the coach on the way to Chamonix to pick up Orianne before we go through the Mont Blanc tunnel. Less than 2 hours to Pila! Yippee. 0630 UK time and the sun is shining. About to stop for breakfast! Some children slept all night, unfortunately all those sitting close to your skiing correspondent did not. He had to get his angry voice out of his pocket at one stage! We will have some tired and grumpy children (and staff) later today! It is a BEAUTIFUL day as we get closer to the mountains and begin to see glimpses of snow! Coffee would make it perfect! One boy has bought some hand cuffs from the shop – must have sneaked past the censoring eyes of Mrs C. May come in useful later however! One watch lost and found! No TV on the ferry so we are in complete ignorance about the England v France rugby score! Arriving in Calais now – headcount – all here!!! On the ferry, full of private school children all going skiing! 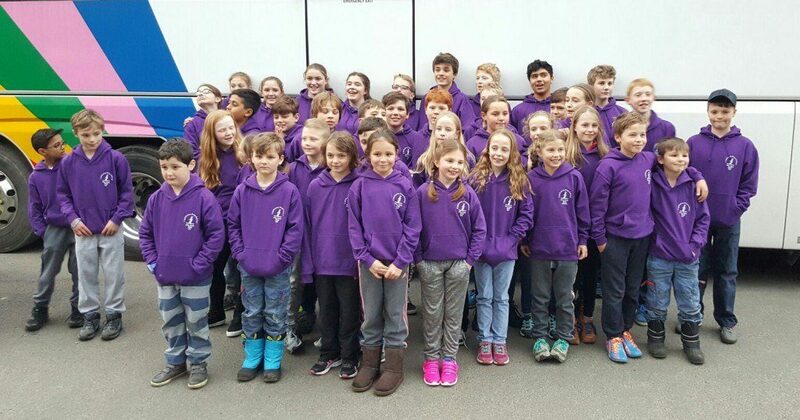 Another school wearing purple hoodies – lime green next year! All children safely onboard, seat belts on, safety briefing from Steve and Phil, our drivers for the week, and off we go! Sweets being tucked into before we got to the end of Mill Lane! Message from Orianne, who flew over today and is meeting us in Chamonix, “superb snow and blue skies for most of the week”. Yippee! Approaching Dover, your entrepid ski correspondent Franz (as in Franz Klammer for those of you of a certain age) is hoping the customs officers allow us through without the need to get off the coach. Two Australians on board may cause us all to get off! Hay ho, such is life! Herding cats on skis is a fabulous image that’s kept me smiling this morning. lovely to hear how you’re all getting on with your blog. thank you! All sounding like “rather you than me” as I sit in the basking SA sun!! I’ve actually laughed out loud at several parts of this blog post so far! Very glad to hear that Bubble’s injury wasn’t serious! Looking forward to seeing ski photos! Thanks so much for keeping us all updated with your amusing anecdotes! So glad my lovely girl has not been mentioned for having any broken limbs – sorry Emily! I bet dads pleased. Hope everyone has a wonderful time – feeling very jealous. Mr. Jones you have the patience of a Saint….. AN don’t forget your ski socks – Dad ! Please tell Abigail Frisky full of beans and looking forward to showing off his new toy. Wonderful blog, more piccies please! Can you confirm your homeward coach route please in light of yesterday’s events is there anything redirecting you?…thank you! Loving the blog! Hilarious! Thanks for the mention that Luke was ok! Which NJ is best at racing turns? What wonderful, fun loving and polite children we have! Saw many of them skiing their hearts out around Pila today. They didn’t look ready to come home! Thank you to the Jones family and staff for yet another successful trip. Felix hasn’t stopped talking about his amazing, fantastic holiday!! He wants to go next year!! So put us down for a space next year! !